Upon hearing that KidsHQ were holding a Music Class for toddlers, I was very much excited to check it out, since having already been to KidsHQ plenty of times before and loving the ambiance created by the friendly staff. The Magical Music Box is a one hour music class that you and your child can attend, that involves playing with musical instruments, meeting new magical characters and singing along to nursery rhymes as well as pop music. The Music Class is held in a cosy and colourful little room, with plenty of pillows and soft rugs, creating a snug and vibrant feel. The class began with a song as the two “teachers” of the session introduced themselves. Both of them were upbeat and cheerful, making all the kids laugh at any given opportunity. I loved that the class was interactive too as they picked out some of the toddlers to help bring the Magical Music Box to life. Since they were all given name tags, the kids were called out by their names, which made it more personal and friendly. Baby Z was asked to ring a tiny bell, which he was very proud to have done so. 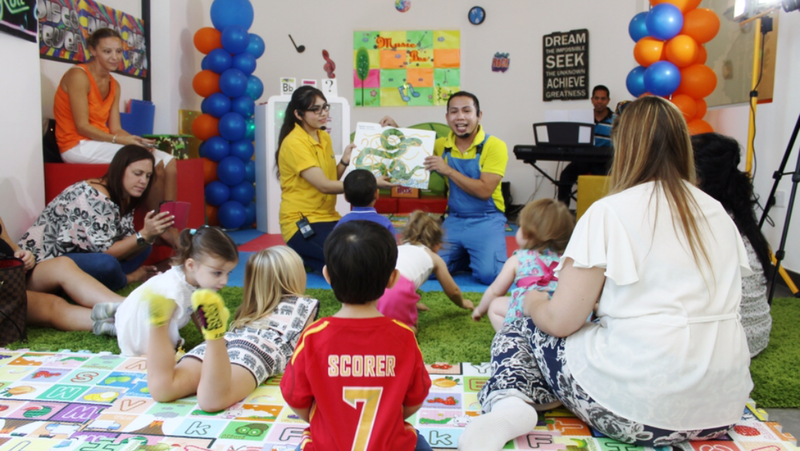 Through out the class, the kids were introduced to an alphabet, a number and an action that was reinforced through song and play, therefore adding an educational element to the Music Class. There was also an appearance of a monkey puppet, which all the kids loved to give a Hi-five to, though Baby Z was a little freaked out at first. I also loved that they sang through a book, mimicking animal actions, which grasped the attention of all the toddlers. They were also given rattles to shake as they sang songs. 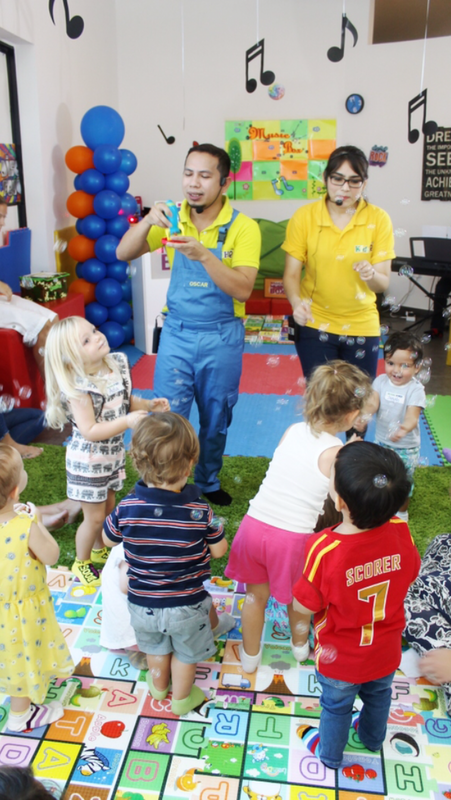 For more sensory activity, bubbles were blown and everyone enjoyed catching and popping the bubbles, because let’s be honest, which kid doesn’t love doing that? I also appreciated that both “teachers” had Mics on, and so their voices were loud and clear for everyone to hear, without having to shout over the excited squeals from the kids. There was also a pianist to create music that went along with each activity. The duration of each activity was short and snappy so as to capture the attention span of the kids without boring them. Baby Z’s favourite part was dancing along with the shiny pom-poms, which he really enjoyed waving in the air, and so did the other kids. I would have liked to hear more nursery rhymes that the kids could sing along to, but they did include classic pop songs that all the mothers knew the words to and were secretly grooving to them as the kids danced wildly in front of them. 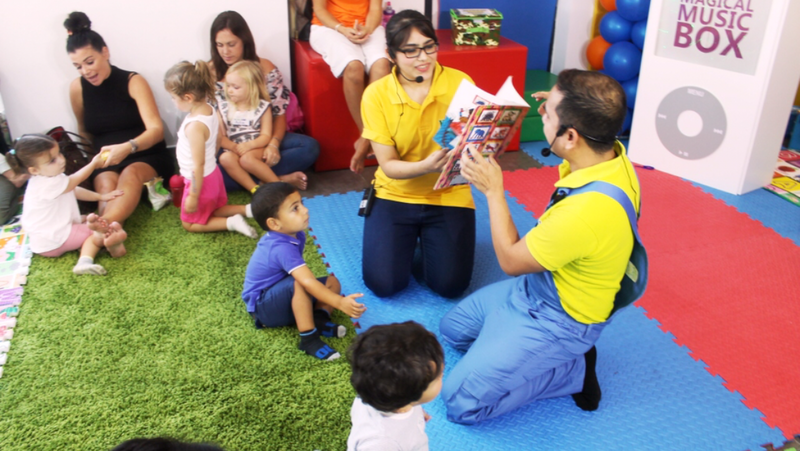 Though Baby Z was rather shy at first, he was really into it by the end, and it was pretty evident that all the other kids had a great time too as they jumped, danced and sang at the top of their voices throughout. To end the music class, each toddler was given a balloon, making them the happiest little children in the world and something to talk about for the rest of the day. The best part was of course that as soon as the music class was done, any remaining energy that needed to be burnt off, could be done so upstairs in the KidsHQ play area, with a huge play jungle including trampolines and slides, whilst the parents sip quietly on their coffee in the cafe area right opposite. It’s a Win-Win situation! 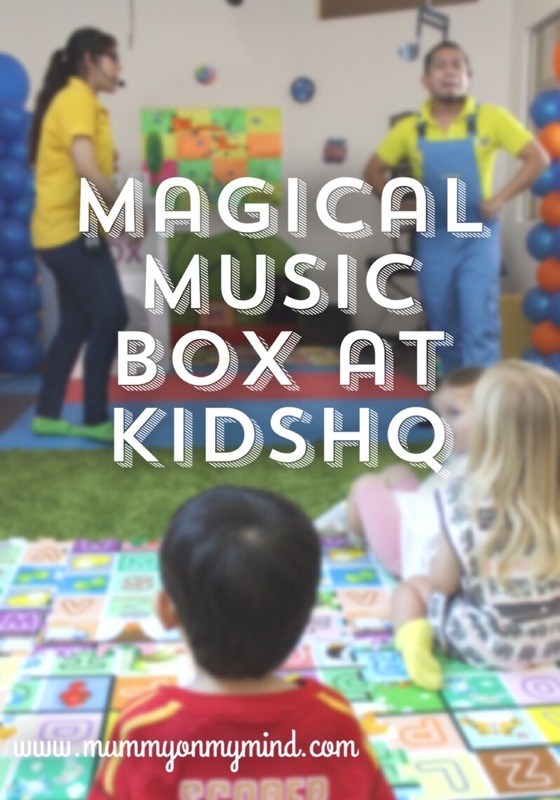 The Magical Music Box Class will be held from 12th September onwards, costing AED 60, amongst numerous other activity classes being arranged by KidsHQ. For more information on how you can book your class, head over to their website or call them directly on 040 379 4233. You can also stay updated with the latest by following them on Facebook and Instagram. Note: I was invited to attend the Music Class by KidsHQ, however all views and opinions expressed above are honest and solely my own. Yes, very true! It was such great fun!